Question: Why does the exit from Egypt occur in the darkness, late at night? Is it not tied to time? Answer: As time passes, there are no changes in spirituality. Only the animate body grows along with its earthly desires. Meanwhile, there is no time in spirituality. If you performed no action, the time stood still. In the spiritual world there is no axis of time, meaning the axis where our actions get deposited on. Time in spirituality is the amount of actions, the chain of causes and effects that you have realized. Question: How can we know what desires we need to correct? Answer: Everything becomes revealed along the path. We don’t know what it is all about, but there is an order to the actions a person must carry out, as Baal HaSulam and Rabash explain to us. They were the two last Kabbalists who created a method suitable to the souls descending into this world in our generation and detailed all our work regarding the soul’s correction. By correcting it we reach revelation of the Creator; the reality and the world unfold before us—it is happening here and now. All the worlds, souls, and upper forces, everything is right here, but we don’t feel it. We must cultivate a sensory organ within, discover our desires as deeply and widely as possible, give them definitions, feel changes in them, and arrange them so as to discern all their peculiarities and components. We must feel the entire depth of the existing reality so that our impressions and sensations would merge into one image regarded as the Creator, the upper force. Similarly, we attain the authentic reality as we rise along the steps of the five spiritual worlds, where in the world of Infinity everything unifies as one whole. All that we attain on the path, we attain in small doses, as individual parts, after which everything merges into an integral form. This is the perfection we are to achieve. The Creator created the infinite desire to receive with the help of the Light of Infinity. 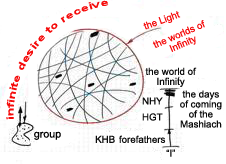 In relation to the Light, this desire begins to feel itself divided into many parts or segments, like our body which consists of different systems and subsystems, such as the lymphatic, circulatory, nervous systems, and many others. There are more important and less important systems. All the systems are equally important in the perfect state, and when one small part is absent, the entire system ceases to be perfect. This is clear. But when we speak about the way the system operates in the process of correction, when we rise from this world into the world of Infinity, a certain order of correction exists. The correction happens from below upward. The first ones to be corrected were the souls of “forefathers”: Abraham, Isaac, and Jacob, who represent the three lines, three big systems, KBD. Then there came HGT, “sons,” followed by us, the last generation, NHY. We belong to the last generation of Mashiach (Messiah), we perform the final correction, and this is why we are the biggest egoists, while our “forefathers” are pure, fine souls. All different types of souls exist in the collective soul: men and women, souls that pertain to the Rosh, Toch, and Sof and the limbs, arms and legs, the right, left, and middle lines, such important organs of the system as the brain, heart, liver, kidneys, lungs, and so on. The wisdom of Kabbalah explains all of this in great detail. We are gathered in groups around the world according to this and are interconnected in a certain way. Each one of us is awakened because the root of his or her soul becomes awakened, each one of us comes from another place in the common desire, and this entire system needs to connect into one whole. For this reason all of us have been gathered into the group where we try to unite between us. The group is a complete system, and if we connect into the group, it is the upper force connecting us. And when we will attain unity, we will build the exact system that will merit ascending. We do not need to change anything; we only have to move forward. We are not the ones creating the structure of the group, and we never find out why we are in a group with these specific people. This is what we have received and that is it! We do not know or understand whether these people are worthy of spiritual ascent. The Creator knows it! This is revealed from Above through the Light that affects all the desires. The Light selects the desires that need to be corrected now, in our time. Every year and every minute new desires become revealed and new people discover the wisdom of Kabbalah. Question: It is written in one of the books that there are spiritual objects. What are they? Answer: In our world there is nothing that would connect us with spirituality besides special books. These books carry spiritual significance because they really speak of spirituality. Reading them, a person attracts spirituality to himself or herself. It is most advantageous to read these books in the group when everyone gathers together with the intention and attracts the Surrounding Light. Besides the environment, meaning the group and the books, there is nothing in our world. I highly recommend that you always be with a book wherever you are. If you have a few free minutes, short breaks at work, open a book and read a short excerpt. Little by little you will start noticing that you are drawn to it more, advance more, and that all your thoughts are changing. Start getting used to it. I grew at Rabash’s very simply: There weren’t any computers back then, and I always had a book in my hands. Wherever I went, I had a book with me. This is how I re-read all the books many times. I even used to take The Study of the Ten Sefirot with me, a book that is hard to read in the middle of the street. But it contains a section with questions and answers, and I read them. I also read The Book of Zohar and different articles. Today we have a wealth of books. I think that everyone should have them at home. Each month you can read a different book, not from cover to cover, but wherever you open it. This is what Rabash taught me to do. During our walks, if he got tired, we used to sit for a few minutes on a bench. I always had a book with me. He would open it at random and start to read. After a few lines, he would close the book and continue the walk. And that’s how it was all the time! Do it: Get a portion of the Surrounding Light for half an hour or an hour, and then do it again and again. A book has to be in your hands. This is why I’m for publishing them in a pocket-sized format. There are many stories in The Book of Zohar that are written in allegorical language (Midrash). They are seemingly describing people and angels (the forces of nature), animals, and plants, which is because the Book’s authors wished to explain all levels of creation to us: the still, vegetative, animate, and speaking. 1. “Preface to the Wisdom of Kabbalah (Pticha)”: It is a scientific preface where he explains the structure of the worlds, Partzufim, Sefirot, and the interaction of the Lights and desires (vessels, Kelim). 2. “The Preamble to the Sulam Commentary”: It is connected to the above mentioned preface. Here, he also explains how to work in the three lines, with Lights and desires, if only in a more particular form, closer to each soul. 3. “Preface to The Book of Zohar”: In this introduction, Baal HaSulam explains the perception of reality. He describes how we transition from our ordinary, corporeal perception of reality to the spiritual one, when we start perceiving reality through this world, which becomes transparent, and see the forces working in it instead of the external picture of the world. Similarly, when we look at the computer screen, we see a certain image. But it exists only pertaining to us since we created this screen and this method of projection on purpose. In reality though, it is merely an external manifestation of information stored inside the computer, on its hard drive. If we could read information directly from the disk, we wouldn’t need to retrieve it onto the screen and read it from it. The wisdom of Kabbalah is the instrument that allows us to enter the internal, concealed part of reality and see not the external form presented to us at the moment, but rather the internal activity: the forces working behind the scenes of the familiar image of the world. In this introduction, Baal HaSulam also explains that our perception of reality is divided into four components: the essence, the abstract form, the form clothed in matter, and the matter itself. Until the final correction (Gmar Tikkun), we attain only our matter (desire) and form that this desire assumes: either an egoistic or altruistic one. We cannot know the abstract form and less so the essence. Thus we advance to the final correction. Hence, the wisdom of Kabbalah gives us a very serious warning not to indulge in fantasies, but rather to be realistic and use a scientific approach while striving to discover the spiritual world in a sound, tangible form. 4. “Introduction to The Book of Zohar”: Here, Baal HaSulam explains various problems a person faces in his or her questions about who we are, what our essence and role in this world is, why the Creator created us so flawed, low, and despicable, why we must walk this entire long path and become equivalent to Him, and so on. In the beginning of this introduction, Baal HaSulam asks these questions and answers them further on. And in the end of the introduction, there is a very special, well-known, and widespread part where he writes about our correction in our days. There he explains that the world is divided into inner and outer parts. People who feel they belong in spiritual attainment are regarded as the inner part of the world. It is they who must unify among themselves and use The Book of Zohar to draw the Light that Reforms to themselves. By doing so, they will become the spiritual source and the spiritual center of the world. Having the spiritual force, they will be spreading the wisdom of Kabbalah, and the whole world will get to feel that they have something exalted: knowledge, wisdom, the correct, common sense approach to what is happening in the world, and the answers to questions about it. The world will begin to understand that these people reside at a much higher degree than all scientists and the so-called great leaders of this world since they possess the knowledge of the forces that act and transform our world in such an unpredictable way. Then, after resistance and confrontations, the world will still begin to feel drawn to these people and recognize in them the upper force, the upper wisdom. And thus, in the end, the whole world will arrive at correction. After all, correction is basically performed between the individuals who are regarded as the inner part of the world, the ones with the point in the heart, while the rest of the world will only join in and cling to them, just like today in the world the masses live their daily lives while the world is ruled by a handful of others. 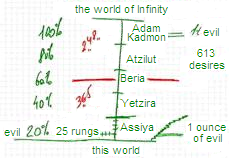 And thus, as Baal HaSulam explains in the end of the “Introduction to The Book of Zohar,” the entire humanity will keep developing until the world unifies together, all become as one whole, thanks to the same Book of Zohar, and reaches the same very ten primordial Sefirot that Rabbi Shimon and his nine disciples wrote about. Rabash, Social Writings, Shlavey HaSulam (Steps of the Ladder), Article “Concerning the Importance of Friends”: Each student must feel that he is the smallest among all the friends, and then he will be able to receive the appreciation of the greatness from everyone. This is so because the greater one cannot receive from the smaller one, much less be impressed by his words. Only the lower one is impressed by what the greater one has appreciation for. It is said about it: “I learned a lot from my teachers, more from the friends, and more than that from my students.” How can one learn from his students? If I lower myself and raise them in my eyes instead, then through them I am able to receive. After all, in our souls, we all reside within a unified system. This is why Rabbi Hanina Ben Dosa (1st century BCE), a great Kabbalist, said that he was learning the most from his students because he had an opportunity to nullify and lower himself before them. So do we in our integral, big group where we must especially value those who are working really hard on self-renouncement, despite the fact that it is doesn’t look so on the outside. This labor is the most difficult since it is directed precisely against the ego. But the more I lower myself, the more I receive. Even in the egoistic sense it’s worthwhile. In the outside world, we are witnessing the same: By getting hold of ourselves, we can hear the others and learn something. And the other way around: By being arrogant, we learn nothing from no one. If I place myself above the others and despise them, I remain empty. So, renouncement of self is beneficial even from the egoistic point of view; it is a condition on which I can bond with the group. But while in the egoistic society I lower my head in order to receive from the others as much as possible, in our group, I lower myself before the friends in order to receive from them spiritual influence, awareness of the greatness of the goal and the Creator, the force that will help me rise above egoism. Herein lies the difference: On the outside, I act the same but with an opposite goal in mind. Each student must extol each friend’s merit as though he were the greatest in the generation. Then the environment will affect him. I can receive only from a higher degree. Hence, not only do I need to lower myself, but also exalt the environment, the group, and the friends in my eyes. Rabash, Writings of Rabash, Shlavei HaSulam (Steps of the Ladder), Article “What to Look For in the Assembly of Friends“: The answer is that love of friends that is built on the basis of love of others, by which they can achieve the love of the Creator, is the opposite of what is normally considered love of friends. In other words, love of others does not mean that the friends will love me. Rather, it is I who must love the friends. If I second the group or the Creator on what they have started, after they have already revealed themselves, it means that I am working egoistically. From the group, I must ask only for the greatness of the goal. Nobody becomes aware of the greatness on his own; we only speak of it in order to artificially elevate ourselves to this degree. And that is what makes us grow independently. If love of friends’ gets revealed to me beforehand, my reaction will be based on purely mercantile considerations. I will respond to the friends as to any well-wisher. After all, it is pleasant for me to deal with him. Therefore, I shouldn’t seek any signs of the group’s favorite attitude toward me. The Book of Zohar tells about the disciples of Rabbi Shimon: Whenever they got together, they would feel mutual hatred at first, and then they would start studying and overcoming it. So do we start convincing ourselves: “Whatever I see, I see it in the mirror of my ego.” Everyone judges according to their own flaws. Only later do we come to the authentic love that lies above hatred. Therefore, the key is not to trust one’s own eyes or heart. I simply don’t focus on the others; let them do whatever they want. As to my own behavior though, I must act as my teachers instruct. If I start expecting something from the others, I will never see them do anything good. The Creator intentionally makes it so that I always see flaws in the group since I see them through the prism of my egoism. I feel resentment and disdain toward the friends; I have no slightest desire to unify, sit down, and talk with them, and I have thousands of excuses to refuse to do it. And yet, I must move all obstacles to the side and understand that it is a game that is played with me on purpose. If I came to the circle of people who have a spiritual desire, it means that the Creator selected them. And since He chose them, I must “cleave” to them. It is my “womb” where I will grow. I don’t have a choice: I must connect with the friends, indeed believing that they are the greatest of the generation, the best representatives of humanity, who came to lift me up. The group is the elevator that takes me up into the spiritual world.